So how was Air Asia? – My review. How was Air Asia? Awesome! After taking 8 flights with the airline in the last 2 and a half weeks I feel I have the right to say so! Any Air Asia promotion is going to save me so much money that I would be crazy not to fly with them. It means I can upgrade my accommodation. Short term pain for long term gain. As we have 5 members of our family, we initially booked with Air Asia because they’re affordable but after the last 2 and a half weeks, I wont be flying to Asia with any other airline. 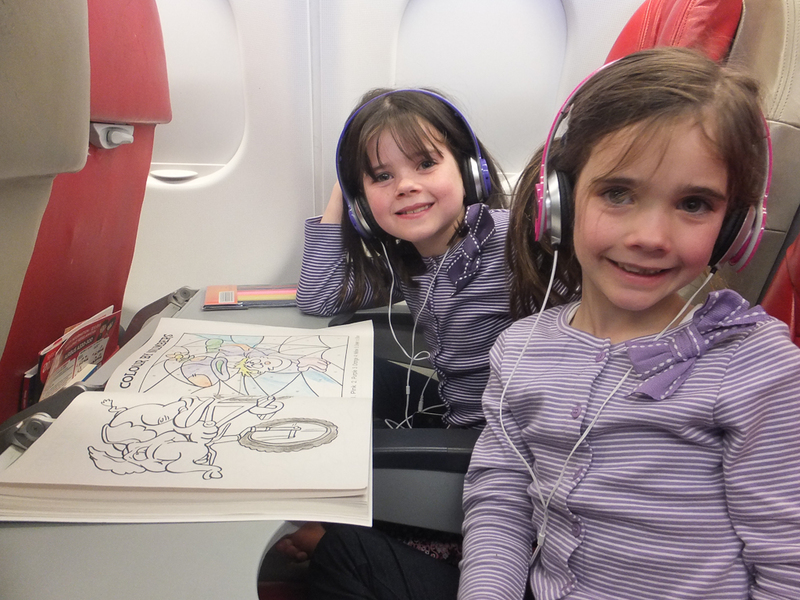 As previously posted, we saved a small fortune flying with Air Asia. I have since have other issues with Air Asia moving flights and then not being able to make connecting flights so be careful of booking connecting flights seperately. The long haul flights (Melbourne-Kuala Lumpur and back again) I found the economy class seating so spacious. I tend to struggle as my thigh bone is quite long and on every other airline I have found that my knees touch the seat in front of me. On Air Asia X this did not happen. I was even able to comfortably cross and uncross my legs. Especially good when you have a sleeping child on your knee! 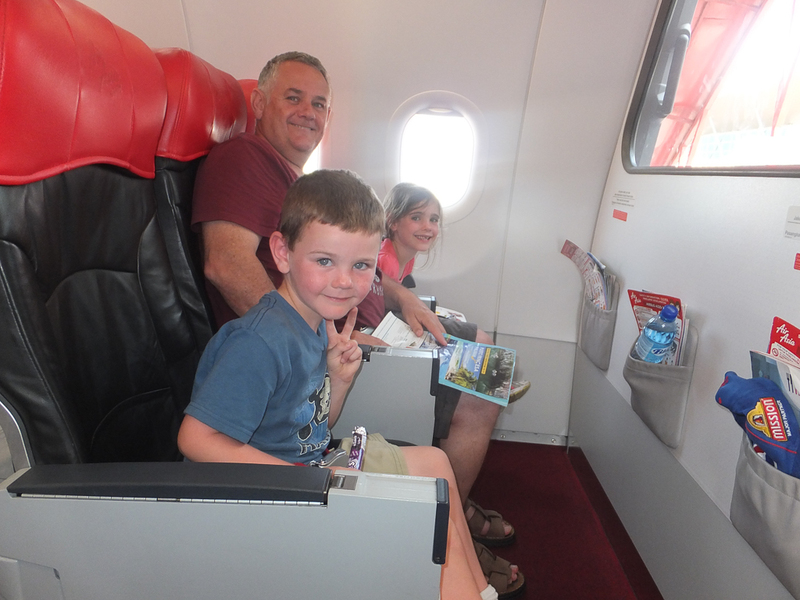 The short haul flights were not as spacious but were no different to any other airline and seeing as you are not on the flights for extended periods its manageable. One of our flights was cancelled and we were moved to an earlier flight, when we checked in we had been allocated ‘hot seats’ which is a premium seat. The kids were exceptionally excited about sitting in row 1. Pretty happy about being seated in Row1! We also found the airline to be efficient. There was no messing around, the previous passengers disembarked and within 10 minutes the next flight was boarding. They departed on time every time, they were never late on arrival. I was really impressed with how quickly they were able to turn around their flights possibly saving them a fortune on tarmac costs. The food is very cheap and it is no better or worse than any other airline meal – I think that’s fairly diplomatic of me. There is a good amount of variety if you book online before you leave and the kids meals arrived promptly and those that had pre-ordered were served first. You are able to purchase meals on board but you are relying on what is available and they do not guarantee there will be anything available. My one issue was that it took an exceptionally long time for them to clear the rubbish on the long haul flights. Whilst this wasn’t an issue for me, the kids were a little impatient waiting for clearance to be able to continue colouring on their tray tables. The one issue I did find was that 2 of our flights were cancelled and required us to rearrange some plans. We were booked to return from Sandakan to Kota Kinabalu at 7pm at night, this flight was cancelled and the only other flight was at 2.30pm. I had a private driver booked and paid for and the tour company would not refund half my money even though I would only be utilising their driver for half of the requested time. No big drama really particularly since the Australian Government currently has a travel warning to this area and I was a little nervy about taking the kids there to begin with. The flight change allowed us to visit Sepilok Rehabilitation Centre and the Bornean Sun Bear Conservation Reserve and then return to the airport and fly back. I had hoped to also visit the Proboscis Monkey Conservation Centre but I did Sepilok which was my main focus. The flight change also ensured we had no down time in Sandakan which suited me just fine. The second flight that was cancelled was out return flight home, oops had to spend an extra day on holidays, now that cant be all bad!! It meant that we returned to Kuala Lumpur for 2 nights and didn’t have to return to The Youniq Hotel which we stayed at for 1 night on our way to Hong Kong (I hated that hotel and area and was very glad to not have to return!). So whilst they had cancelled my flight it very much worked in my favour and we had plenty of time to make other arrangements. These flights were cancelled and re-booked before we departed Melbourne so I was able to re-do the itinerary and make it work for us. So would I fly with them again? In a heart beat, and have an extra $4000 in my pocket, for sure! I have flown with them so many times since this post and I have another 4 flights with them this year. As long as you are aware of their rules and play fairly you shouldn’t have any problems. Basically, it’s a budget airline, don’t expect the bells and whistles and don’t expect to be able to change anything unless you pay a fortune. Otherwise you should be right! This is how we roll on board! Have you flown with Air Asia? Did you purchase tickets during the twice yearly Air Asia promotion? I am interested to see the prices once they start flying from Avalon. My top place to stay in Kuala Lumpur is at the Lanson Place Bukit Ceylon Hotel, its in a great location and easily get to the monorail to get around the city easily. Make sure you visit Batu Caves Hindu Temple for a bit of culture, just watch out for the aggressive monkeys!